Graciously support our YP event the evening before the conference. Note: If you see "Extra costs" display upon receiving your PayPal invoice, this means you purchased raffle tickets. If you brought a guest(s) that amount displays as "Guest." If you have questions about this event, email us at info@aratoday.org. 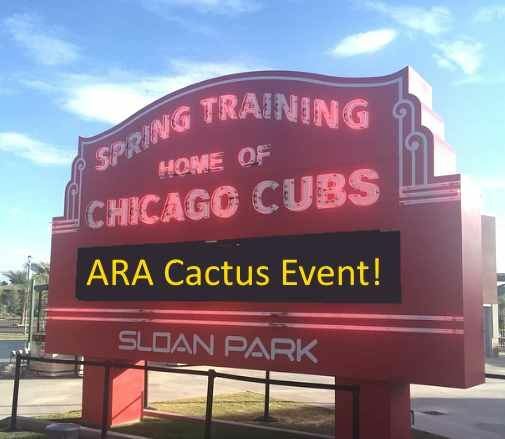 Spend the day with ARA at a fun and educational morning conference, followed by the Cubs vs. Giants at Sloan Field, the Spring Training home of the Cubs. Noon – 5pm - The Game! The Cubs vs. the Giants at Sloan Field (a short 800 step walk from Sheraton Mesa Wrigleyville West. Join us on our own party deck for a great spring training game. Ballpark lunch and beverages will be served. First pitch is at 1:05pm. 2 of each credit for the Corporate Panel Discussion. Casual, sports theme. Please feel free to wear your favorite sports team attire. Calling all YPs - “Detox to Retox with ARA”!